At In-O-Vate, dryer efficiency and home safety is a driving force. The popularity of the Dryerbox® and the Dryer-Ell are both rooted in efficiency. Continuing studies of the way airflow affects dryer performance was a key motivator in developing the DryerJack. The termination hood has an enormous impact on a dryer vent system's total efficiency. Factors that contribute to increases in back pressure include total length of run and the number of elbows. Often, it is the exhaust termination that produces the most excessive back pressure. Venting through the roof is a popular option in warmer climates. Typically, the venting rule of thumb should be: the shortest route possible, the least amount of elbows, and a termination point away from air conditioners, windows, doors and walkways. Since the roof meets many of these conditions, developing an efficient roof vent with a small foot print—that also deters bird and rodent entry—makes sense. The most popular dryer manufacturer indicates that acceptable total systems should have a pressure not to exceed .6 inches of water column (wci). Pressures greater than this are considered restrictive and would not meet building code installation requirements. 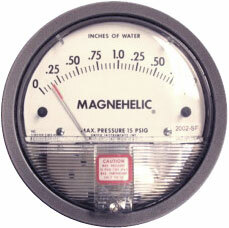 Magnehelic gauges measure air pressure in terms of water column inches displaced. Be certain to view the full testing video. Vane Anemometers measure airflow velocity in terms of cubic feet per minute. The termination is a very important part of the exhaust system. Restriction can dramatically reduce a dryer's ability to vent safely. Every year, there are thousands of dryer fires across North America. Lint buildup is a major contributing factor. Eliminating restriction-points in the exhaust helps improve safety. It also helps save money on power bills with shorter drying times. Back pressure in termination hoods is determined based on the change in air pressure when different fittings are attached to a regular dryer. Using a magnehelic gauge, pressure was measured upstream of the fitting before and after the vent was attached. The lower difference results in a more efficient fitting. The matrix below displays the amount of pressure created by each vent and how it relates to the percentage of airflow in an industry standard installation. Back pressure is the airflow resistance created as the volume of air passing through the duct is greater than the capacity of the duct. Contributing factors to increased pressure include total length of run, restrictive elbows, inefficient terminations and lint accumulation that develops naturally over time. As noted previously, appliance manufacturers (supported by industry standards) generally consider back pressure in excess of 0.6 water column inches to be restrictive. High pressure readings put a strain on the appliance and can shorten the dryer's life span. The extended dryer times also take their toll on the appliance and power bills. In a lab, under controlled conditions, back pressure testing clearly reveals vent termination performance. Airflow velocity measures the cubic feet per minute (CFM) that the dryer is pushing to the exterior termination. Contributing factors to lower velocities include those that create back pressure, but they can also be due to other problems in the system. This could include such things as a concealed duct leak or mechanical problem with the dryer. In addition to the back pressure testing that is used to clearly delineate the effect different terminations have on system efficiency, airflow velocity tests should also be carried out when verifying exhaust performance in the field. To account for these other variables that do not have an impact in the lab, airflow tests should also be performed (behind the dryer as well as at the exterior termination) when testing dryers in real world applications. A dryer exhaust system with good airflow should push 1,500 feet per minute (or 8 meters per second). If back pressure is within a normal range and airflow velocity is less than 1,500 feet per minute, then a leak or mechanical issue may be the culprit. 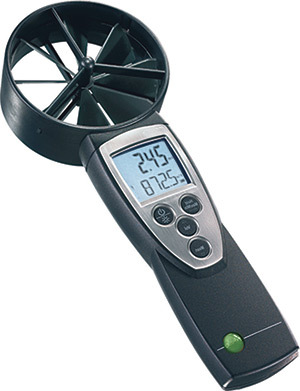 Magnehelic Gauges measure back pressure and vane anemometers measure airflow velocity. The Magnehelic Gauge requires tapping the transition duct whereas the vane anemometer checks CFMs both behind the dryer and outside the house where the dryer terminates. Both provide valuable feedback.